The Pulitzer Prize–winning author of Peter the Great, Nicholas and Alexandra, and The Romanovs returns with another masterpiece of narrative biography, the extraordinary story of an obscure German princess who became one of the most remarkable, powerful, and captivating women in history. Born into a minor noble family, Catherine transformed herself into empress of Russia by sheer determination. For thirty-four years, the government, foreign policy, cultural development, and welfare of the Russian people were in her hands. She dealt with domestic rebellion, foreign wars, and the tidal wave of political change and violence churned up by the French Revolution. 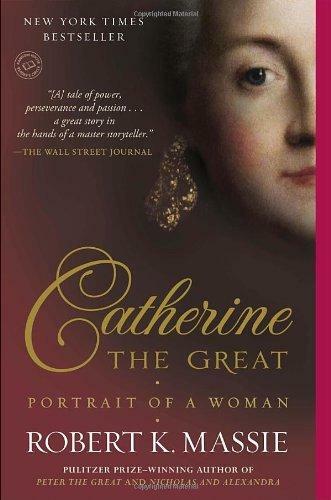 What did you know about Catherine the Great before reading this book? Were there things you learned from the book that matched your previous impressions of her? What did you learn about her that surprised you? ow important were Catherine’s memoirs to the portrait Massie draws of her? What aspects of Catherine and her early life would we have missed had she not written her memoirs? What reasons might she have had for concluding them at the point she did and not writing about the years after 1758? In the first chapter, Massie writes: “Even as Empress Catherine, at the height of her autocratic power, she wished not only to be admired for her extraordinary mind and obeyed as an empress, but also to find the elemental creature warmth that her brother—but not she—had been given by her mother” (pp. 6-7). In what ways did this wish manifest itself in Catherine’s life? Johanna’s early rejection stung Catherine, and her mother’s domineering and difficult nature later caused Catherine pain and trouble. However, does Joanna deserve credit for having the ambition that led her daughter to an extraordinary life? How would you judge Johanna as a mother, both from a contemporary perspective and from the perspective of the eighteenth-century society in which she lived? Issues of motherhood recur throughout the book. After Johanna left Russia, Catherine faced surrogate mothers in the Empress Elizabeth and Madame Choglokova. How did her relationship with these female authority figures shape the woman she became? How much did Elizabeth’s enforced separation of Catherine and Paul after his birth affect Catherine’s later relationship with her son, “the most psychologically difficult personal and political problem of her reign” (p. 463)? In what ways did Catherine repeat Elizabeth’s example when Paul’s own children were born? How did Catherine change from the docile girl who acted to please her husband in all things into the coup leader who marched to dethrone him? What were the most important steps in this evolution? Which qualities of the future Empress were already there in the Sophia who came to Russia, and which changed along the way? Discuss the contrast between the relative value Peter III and Catherine each gave to their German, Protestant heritage. How did this contribute to their eventual fates? With his toy soldiers and parade ground drills, Peter III displayed a fascination from a young age with all things military. Yet it was Catherine who effectively used the military to seize the throne from him. What were some of the differences in their approaches to the real-world military that led to this outcome? assie notes that “Zavadovsky—unique among her lovers—coveted neither honors nor riches” (p. 444). What role did Catherine’s position and power play in her lovers’ feelings for her? Which (if any) of these men would you say truly loved her? Massie calls Potemkin “a lover and partner who gave her almost everything she wanted” (p. 428). Do you agree with this assessment? Which of Catherine’s lovers do you think was most suited to her? Was there one with whom you could imagine her finding happiness in a long-lasting relationship, had the circumstances of her life been different? Discuss Catherine’s approach to the institution of serfdom. Do you admire her for making an attempt to address the iniquities of a system that was so entrenched in her society? Or do you feel she should have done more to effect real change? How much responsibility does Catherine bear for the suffering of the millions of Russian serfs? “Voltaire began to see in her an enlightened monarch who might work to apply the principles of justice and tolerance he proclaimed.” (p. 335) How much did Catherine work to do so? Would you call Catherine “an enlightened monarch”? Catherine told Diderot: “…all your grand principles, which I understand very well, would do splendidly in books and very badly in practice” (p. 340). In what ways did Catherine attempt to put into practice the ideas of the Enlightenment philosophers she admired? And in what ways did she reject them as being incompatible with the realities of governing? How did the Pugachev rebellion and the French Revolution affect her willingness to rule in an Enlightenment style? Do you sympathize with her for feeling threatened by these upheavals? Catherine’s Crimean trip “has been described as the most remarkable journey ever made by a reigning monarch” (p. 489). What made this journey remarkable? What details of the journey stood out to you most vividly? In what ways did this combining of “a pleasure trip, a royal inspection, and a strong diplomatic statement” (p. 491) mark a culmination of her approach to governance? Are there strategies and tactics employed by Catherine, both in her acquisition of the throne and in her reign, that you see being used by leaders in politics and government today? Overall, did you come away from the book finding Catherine an admirable leader? Why or why not?